The Soscal Avenue Bridge (21C0126) crosses over what will be the Napa River Bypass when it's completed next year. 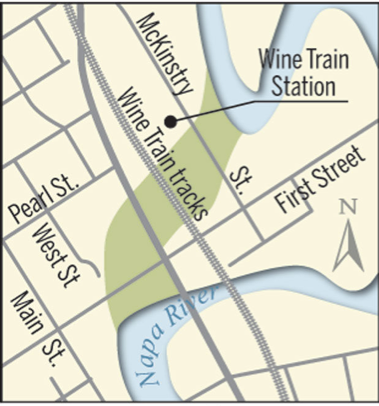 The Bypass will create an oxbow lake at a bend of the Napa River for flood control (as shown on the map below). The bridges are already built for the Bypass (except at McKinstry Street). The Soscol Avenue Bridge is a three span box girder bridge, similar to yesterday's First Street Bridge, but shorter and with columns instead of pier walls. It's 335 ft long with a 139 ft span over the bypass and it's 68 ft wide. It's almost two parallel bridges with an opening in the deck between them. The bridge has similar architectural features (such as haunched girders, old fashion barrier rails and lampposts, etc) to the First Street Bridge. It was built in 2004 and carries almost 20,000 vehicles a day, despite having a railroad crossing just north of the bridge. Napa County, California Bridges: Soscol Avenue Bridge across the Napa River Bypass by Mark Yashinsky is licensed under a Creative Commons Attribution-NonCommercial-NoDerivatives 4.0 International License.